The way things are going, it looks as if Ben Affleck is well on his way to becoming an extremely impressive all-round filmmaker. Having already shared an Oscar with Matt Damon for demonstrating his writing chops on 'Good Will Hunting' (back in the now long-distant past that was 1997), both his directorial debut 'Gone Baby Gone' and now 'The Town', in which he shares another writing credit, show he is quickly establishing himself as a very capable director too. It would be well worth keeping an eye on what ever project this gentleman chooses to helm next. Part heist film and part police procedural, 'The Town' sees Affleck as a meticulous Boston bank robber unwittingly enamoured with the manager of a branch his team targets. While entering into an unwise romance with the woman, who does not realise he was the masked raider she met a week ago, he must also avoid the ever-tightening net of a scrupulous FBI investigation (led by Jon Hamm) and reconcile himself with his own past as he tries to build a better life. It seems Affleck has decided that the best way toward a better life is by repeatedly plundering banks and holding up armoured cars, often after conducting research so lengthy and involved that he knows the salaries and even names of those his team will find themselves up against. Gradually, the net closes on these robbers and the stakes, be they dramatic, romantic or even financial, also rise ever higher. Despite all the action scenes and explosive set pieces this demands, 'The Town' has absolutely no desire to mess around with showy camerawork or overwrought special effects and instead concentrates on delivering a tight and intelligent thriller. Affleck seems equally as comfortable directing the drama as he is the gunfights and his cast are excellent. Of particular note are some superb supporting performances by such veterans as Chris Cooper and the late Pete Postlethwaite, while Jeremy Renner excels as Affleck’s frustrated and violent best friend. More than a few comparisons have been made to 'Heat' and I’ve no wish to enter into any great discussion or comparison of the two, save to say that, while 'The Town' doesn’t have quite the style or craft of 'Heat', it is altogether more intimate. We better understand the aspirations of its characters, who are shot in a far more personal and more tangible way. They are still very much connected to their blue collar experiences and, scene by scene, we get to see how the story is written on their faces. This is definitely one of the finest films of 2010. It’s disappointing that the DVD doesn’t have much to boast in the way of extras to supplement what is such a good film. There’s the standard slightly sycophantic appraisal of the director, delivered by a range of talking heads, as well as an extremely short documentary on shooting in Boston and how Affleck sourced some locals to add authenticity to the production. And that’s it. 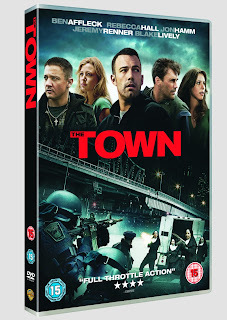 Purchase 'The Town' on DVD and Blu-Ray at amazon.co.uk. Read Saam's review of the theatrical release here.